With the turn of the year now into 2019, Western banks, especially those in Europe, are about to experience some new and difficult requirements come March 31. And this is because Basel III will come into effect. The primary change that Basel III will force onto financial institutions is that of new capital ratios meant to protect banks from insolvency and potential runs by depositors. 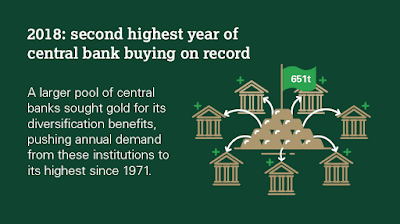 And with a new report out last week of central banks buying gold at the highest levels since Nixon took the dollar off the gold standard, their purchasing of gold may just be tied to the upcoming Basel 3 since holding the precious metal will not count against their capital requirements. What is the relationship between Basel rules and gold? Basel rules are a set of recommendations on capital requirements for private banks. Bank assets are divided into several groups based on their perceived riskiness, with bonds and gold in the least risky category. Banks were required, according to Basel I rules, to cover 8% of their assets based on a special formula. The objective was that at least a part of the total banks' assets would be backed by assets, including gold, that were perceived as safe. Basel III rules abolished the Tier 3 capital class, and all assets fell under either Tier 1 or Tier 2 capital. In Basel III, gold's liquidity haircut is increasing to 85% from 50%. This percentage is used to help calculate a so-called liquidity buffer known as the net stable funding ratio (NSFR) that all banks must hold from 2018. The higher NSFR, the more funding is needed to meet the overall NSFR requirement. So with central banks playing the game of vilifying gold for the common investor while at the same time buying it at depressed prices, the fundamentals for the gold price to move much higher are incredibly strong, especially judging how stock prices soared over the past five years from so much direct central bank intervention. So is THIS the prelude to the RESET ?